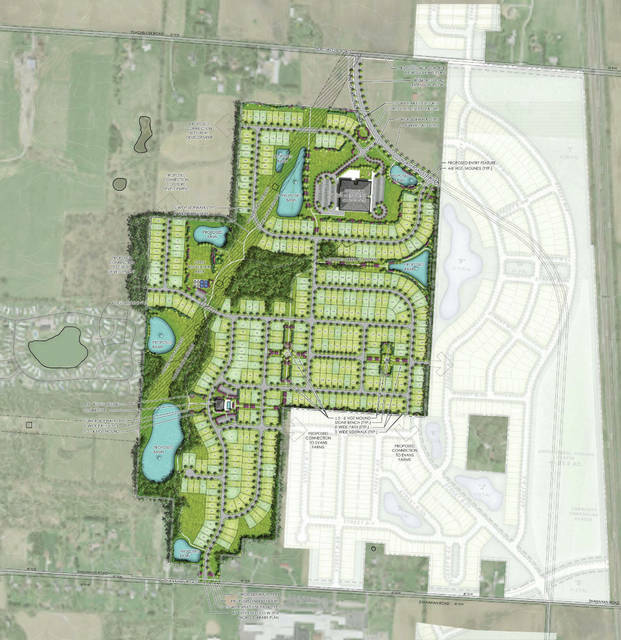 Plans for the Berlin Meadows subdivision were tabled at a brief Berlin Township Zoning Commission meeting on April 9. Applicants were seeking to rezone about 205 acres of land that is zoned Farm Residential District between Peachblow (to the south) and Shanahan (to the north) roads in Lewis Center, west of Evans Farm. About 184 acres would become Residential/Planned Residential; and about 21 acres would become Planned Commercial and Office District. The preliminary development plan is scheduled to go before zoning officials again at 7 p.m. June 25. If approved, there would be 384 units constructed in seven phases, each takes 12-18 months long to complete, starting in 2020. Berlin is a booming area, with dirt being moved across and adjacent to the township hall on Cheshire Road. Also happening in Berlin township: The intersection of Cheshire and Piatt roads will close in June to construct a single-lane roundabout. The work is scheduled to be completed by August and open for the 2019-2020 school year. https://www.delgazette.com/wp-content/uploads/sites/40/2019/04/web1_BERLIN-illustrative.jpgCourtesy drawing | Berlin Twp.